St. Patrick's Day in Ireland celebrates when a saint named Patrick converted many people of Ireland into Christianity. This holiday is celebrated on March 17th each year. 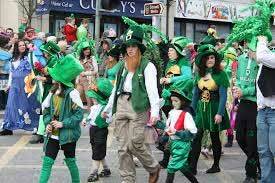 Most people have parades and festivals to celebrate the Irish culture. Most businesses are closed, however pubs and other stores mostly remain open and might even open up earlier than normal. St. Patrick was originally a wealthy person that got taken prisoner and forced into slavery. Once he escaped he devoted his life to Christianity and converted others towards Christianity. Patrick died March 17th, 461 AD. St. Patrick's Day became an official holiday in 1903.